WHEN DONALD TRUMP shut down the government, just before Christmas, his opponents privately shuddered. Illegal immigration, the issue he had chosen to stand on, was his most powerful weapon. And, though bloodied in the mid-terms, he retained some of the imposing aura that his stunning election, loyal base and two years without serious political opposition conferred. Yet five weeks later, with daily reports of coast guards visiting food banks, IRS desertions, and FBI indictments postponed for want of cash, Democratic opinion has been dramatically revised. Mr Trump’s opponents think they have got him at last. A Democratic congressman told Lexington it was “unimaginable” that Mr Trump will be re-elected next year. A more dispassionate reading of the shutdown’s political fallout, as Senate negotiations point to a possible end, suggests that Mr Trump may suffer no worse than a bruising stalemate. That is not to underrate how badly he has handled the episode. Indeed, it has been a case-study in presidential incompetence. The sketchiest knowledge of recent shutdowns could have told Mr Trump that whoever instigates one rarely gets what he wants. Voters are liable to blame him, at which point his imagined leverage becomes a handicap. And this was especially likely to happen to Mr Trump, given that most Americans don’t want his promised border-wall and don’t need convincing that the Democrats—the party of government—are not keen to deprive 800,000 government workers of pay. Especially so, moreover, given that Mr Trump boasted that he would happily “take the mantle” of responsibility for the shutdown before it began. Even in the rundown factory-towns of Trump country, voters have been quoting his words back to reporters ever since. The shutdown was plainly a terrible idea. Mr Trump launched it, in response to goading from immigration hawks and with the prospect of a new Democratic House looming, at what he thought was his last moment of unrivalled power. Yet the incoming Democrats’ House majority had already reduced his bargaining room, including any chance of the deal that he turned down last year: billions for the wall in return for a pathway to citizenship for the 700,000 illegal immigrants known as “Dreamers”. Even if those or similar terms were on offer, moreover, Mr Trump seems too cowed by his right-wing critics to accept them. 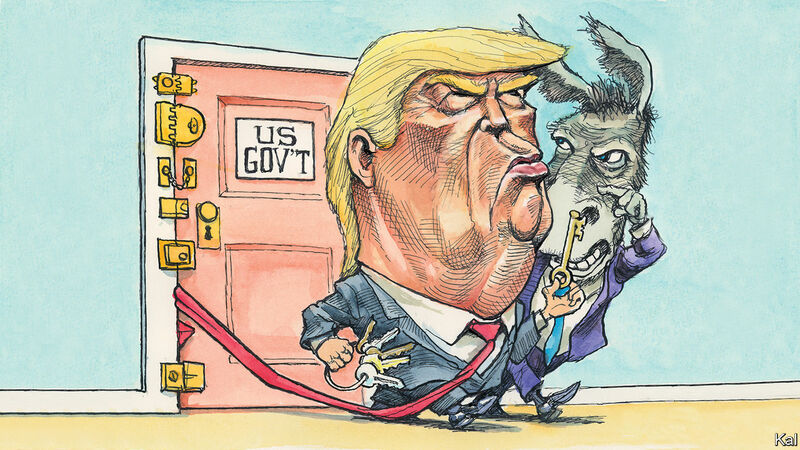 This leaves a more modest fix as a likelier conclusion to the stand-off—the Democrats offer a bit more money for border-security provided Mr Trump reopens the government first. That is embarrassing for Mr Trump. Even so, he has suffered less damage than his opponents think. His ratings, though down a few points, are well within the remarkably stable range they have maintained ever since his inauguration. With around 40% of voters approving of his performance, he is more popular than he was in December 2017, when he signed off on the tax cut that is his administration’s single main legislative achievement. The history of shutdown polling also suggests the knock to his ratings will be short-lived. No party blamed for a shutdown has paid a heavy electoral price for it. Political loyalties are too baked in; the federal government too remote from most people’s lives. After shutting down the government for 16 days in 2013, Republicans swept the mid-terms the next year. Moreover, the nature of Mr Trump’s appeal on immigration issues, which is based more on a sense of shared cultural anxiety with his voters than the promise of a concrete wall, makes them even less likely to desert him. As things stand, the Trump shutdown, already the longest and costliest of recent times, is more likely to entrench America’s political division than alter it. That might end up as a win for the Democrats. Mr Trump’s base, as the mid-terms indicated, is too small to keep him in power. And yet the nativist politics he feeds it with, including the wall, are off-putting to the more discerning conservatives he needs. Elected by a minority of Americans, and ever fearful of the handful of hard-right pundits who seem to speak for them, Mr Trump has in reality always been a weak president. Yet instead of celebrating prematurely, Democrats need to reflect more carefully on why the man who bested them in 2016 might be pursuing such an apparently self-defeating strategy. Compulsion, to be sure, is part of the answer. Mr Trump is facing a storm of investigations, as Special Counsel Robert Mueller approaches his end-game and House Democrats let fly their subpoenas. In response, he needs his conservative cheerleaders to be not sulkily willing to roll out the vote for him next year, but boiling over with protective fury. Yet Mr Trump’s willingness to forsake moderation is also fuelled by his confidence that the Democrats, recoiling against him to the hard-left, will do likewise. And that, Mr Trump trusts, will persuade voters who don’t much care for him to vote for him anyway. This is how the Trump team believes he won in 2016. It considers Hillary Clinton’s contemptuous reference to Trump voters as “deplorables” more helpful than anything the Russians did. It is an over-simplification at best, but one Democrats should be more mindful of than they are. Speaker Nancy Pelosi’s sanctimonious reference to Mr Trump’s border-wall as an “immorality” sounded too much like Mrs Clinton. And meanwhile the left-wing positions adopted by most early runners for the Democratic presidential ticket, including free college and Medicare for all, offers additional encouragement for Mr Trump’s calculation. As the ultimate manifestation of America’s political dysfunction, shutdowns represent a lack of mutual comprehension as well as goals. The Democrats are right to marvel at how the current one reveals Mr Trump’s ignorance of their new strength. But they should be careful. Mutual incomprehension cuts both ways.